Rugby Player on Wood Base - GREAT VALUE! We have sourced these great value rugby player figures for our clients! Perfect to give to players for their achievements. Add some engraving to the base to personalise this trophy for each player. If you would like a logo with your engraving, please add a LOGO SET-UP from the ENGRAVING section. Awesome solid rugby trophy! This is a nice heavy trophy, perfect for all rugby events! This is the small version Balcombe with the rugby ball on top. How about adding engraving to make this trophy really exclusive? 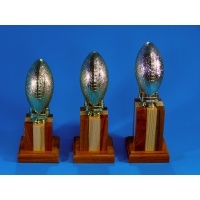 This trophy is great as an individual award or as a floating trophy (floating trophy there are three additional sides that can have engraving). If you would like a logo with your engraving, please add a LOGO SET-UP in the ENGRAVING section. This is the medium version Balcombe with the rugby ball on top. This is the large version Balcombe with the rugby ball on top. 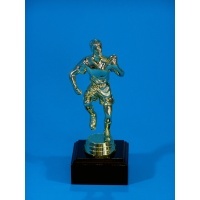 Nice and simple, a rugby player figure on top of our Balcombe wood trophy. 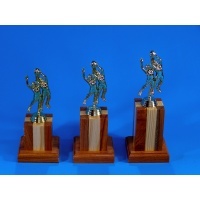 Why not reward your star players with these trophies? This is the small version Balcombe with the rugby player on top. This is the medium version Balcombe with the rugby player on top. This is the large version Balcombe with the rugby player on top. SOON TO BE DISCONTINUED! These lineout figures won't be available shortly, so don't miss out! Last few in stock! This is the large version Balcombe with the linout rugby players on top. This is the medium version Balcombe with the linout rugby players on top. This is the small version Balcombe with the linout rugby players on top. Wreaths always make a good impression! Here is a fantastic rugby tackle trophy for you. This is the medium version Balcombe with the rugby tackle wreath on top. This is the small version Balcombe with the rugby tackle wreath on top. This is the large version Balcombe with the rugby tackle wreath on top. 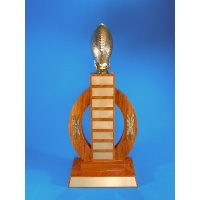 Here is our gorgeous Flimby wood trophy made from solid wood. 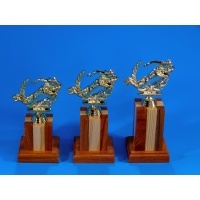 The Flimby is the perfect floating trophy for you with lots of space for engraving each month/year. Made up with a rugby theme as shown. Please choose which ornaments you would like on the sides in the options - you will see pictures of each. Price includes engraving of the title, but if you need a logo included please add a logo set-up from the ENGRAVING section. These Junior League trophies are great for tenpin bowling enthusiasts. Add your engraving for something extra special.